Whether it is the result of damage caused by sun exposure, free radicals, dry climates or harsh treatment, chances are good that your skin is probably aging faster than you want it to. For that matter, clogged arteries and weak immune systems may be aging your body quicker than you would like. While there may not be a miracle anti-aging serum to keep you looking young forever, there are some vitamins that promote youthful skin and help in your anti-aging efforts. 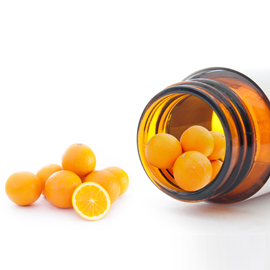 Vitamin C: Vitamin C’s anti-oxidants can protect against cancer causing (and skin ruining) free radicals. It can also help ease muscle pain and ward off the common cold. Vitamin E: Vitamin E protects against cancer while protecting your heart and boosting your immune system. Vitamin E can also help reduce muscle pain and weakness. Some people choose to break open vitamin E oil capsules and use it as a topical wrinkle treatment. Vitamin A: Vitamin A protects your muscle cells from the deterioration caused by free radicals. In addition, vitamin A helps to rid your body of the bad (LDL) cholesterol. Vitamin A can help your body replenish reduced levels of lycopene and lutein.